Due to Malawi’s status as one of the least developed countries in the world, the roles that NGOs and civil society organisations play are crucial to the country’s development, particularly through the health and education sectors. All NGOs must register under the Non-Governmental Organisation Act. There are many NGOs working across the country with rural communities affected by HIV/AIDS. 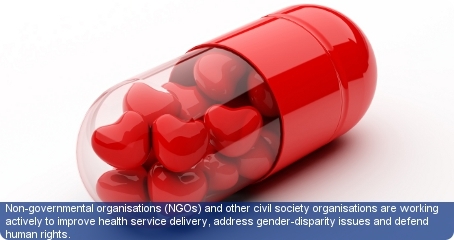 Their work often entails the provision of counselling, support for orphans and anti-retroviral drug programmes. The Civil Society Coalition for Quality Basic Education (CSCQBE) has been commended for its efforts in monitoring the Ministry of Education’s spending of its budget allocation. A report by Oxfam in 2004 noted that the CSCQBE checked whether schools received materials such as textbooks and chalk that were promised to them in the government’s budget, and subsequently reported their findings to parliament and the media. The registration of organisations into NGOs is governed by a 10 member board under the Non-Governmental Organisation Act which was introduced in 2001. Before registration, organisations should register as members of the Council for Non-Governmental Organisation in Malawi (CONGOMA). CONGOMA is the Government’s recognised NGO co-ordinating body. The Malawi Congress of Trade Unions (MCTU) is Malawi’s national trade union centre which supports 20 trade unions and works with various businesses and industries to maintain human rights standards and the social welfare of employees in the work place. Organisations focus on improving the health and environmental conditions on farms and plantations which accommodate for the country’s biggest exports.